Touch screen. Mapping 2D and 3D. Screen size 4.3in. Full postcode search.Maps pre loaded UK and ROI. Pre-installed safety camera locations, subscription required for updates. Points of interest. Photo viewer. SD card expansion slot. Windscreen suction cup. Car charger. Integrated rechargeable battery. Weight 213g. Size (H)8.3, (W)12.5, (D)1.8cm. 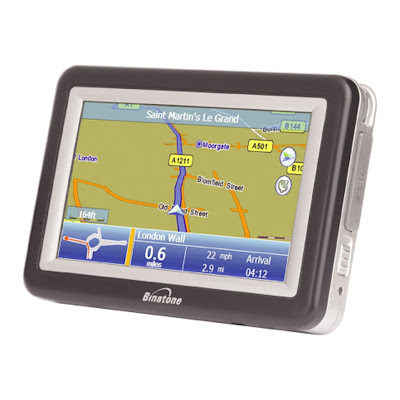 Binatone A430 features full Maps of the UK, ROI are included. Super bright, 4.3 inches anti-reflection touch screen. Super slim profile. Thousands of Points of interest including petrol stations, Hotels, restaurants and local attractions. Multiple languages and user friendly interface. SD Card slot - Use your Sat Nav as a Digital picture and document viewer. 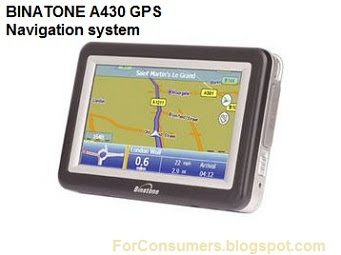 Binatone A430 costs around £40 in UK.